Whether you are shipping paper products, beverages, or electric generat ors Ameri-Can Logistics has extensive expertise to handle all of your dry van requirements. 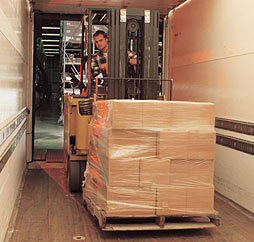 No matter what the commodity, we have the capability to move your shipment to and from anywhere across North America. A large portion of our dry van business comes from transporting courier and expedited freight.On- time deliveries are crucial to our customers and that is why our customers rely on us to get the job done. Ameri-Can Logistics understands the importance of just-in-time deliveries, that’s why we offer coast to coast delivery in as little as four days. Please view a sample of our expedited schedules below. Sample of Expedited Service Times. Contact one of our customer service representatives for more information regarding the expedited services available from your area. For customers who require longer periods of time to load their freight into the trailers or for those customers who ship quite frequently, we offer you trailer pools. Trailer pools are extra trailers that we will spot on your property to give you the convenience of loading trailers as you please and notifying us once it is ready for pick up. We currently have many trailer pools setup across North America and can easily have one setup for you no matter where you are.